Firstly, please let me apologise for the lengthy gap in posts this time; we had a very busy week with the Magpie cousins and then this week I have been trying to catch up on boring things like house work and getting the children ready to go back to school. Into this. In just under an hour! 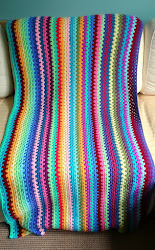 What kept me going when performing this task was the thought of all the knitting and crochet I will be doing in front of the fire this coming Winter. I was quite proud of myself, although this is only a temporary measure. Our proper wood store is under the decking at the back of the house but I knew that Mr Magpie would want to arrange it in his own special fashion. My haphazard stacking was done just so it is possible to access the front door without having to clamber over the pile. The postman got especially grumpy when faced with this task last Autumn. Earlier this week I took the eldest two to buy their shoes and then went on to the uniform shop. Miss Magpie Jr's uniform can only be bought from one of two specialist shops. It is ridiculously expensive and shockingly bad quality. Somehow she had managed to get paint all over her blazer (bought only last year - I was hoping it would last her for her final two years) and it cost an eye-watering £34 to replace. Between the shoes, uniforms and the holidays in general my purse is feeling the strain. Luckily it is the Bournemouth Air festival this weekend so we can amuse the children without the need for a second mortgage. My own 'amusement' will be in continuing to sew name tapes into said newly purchased uniform. Now that there are four pairs of trousers, two skirts, six jumpers and twelve shirts, plus assorted P.E items, book bags, lunch boxes, coats etc, I am anticipating this occupation to last for some time yet. Ouch. Happily, the outdoor knitting time I have been enjoying has seen the completion of Hitchhiker #2. 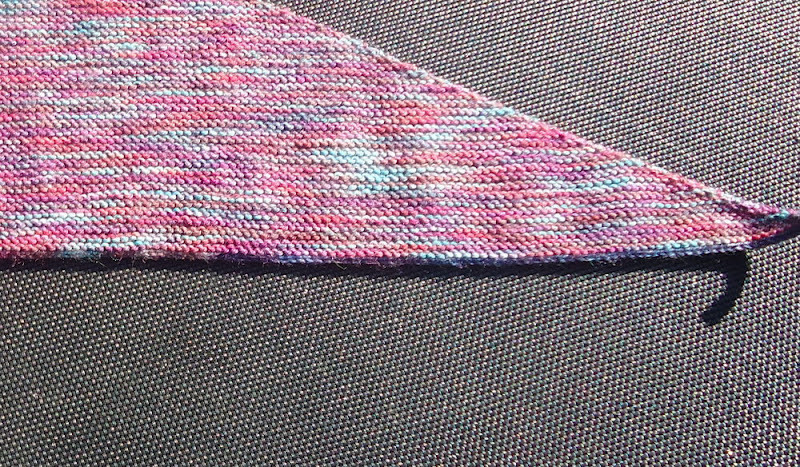 I only just managed 42 teeth on this one, and even then I was about half a yard short for the cast off row. I improvised by using some of the leftover yarn from Hitchhiker #1 but hopefully it doesn't notice. 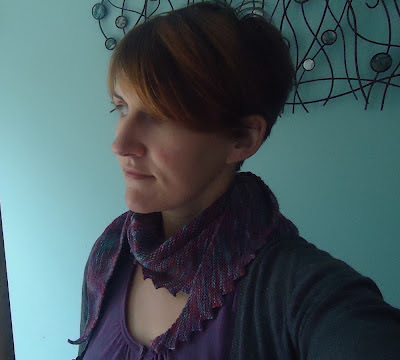 Thankfully, this was the only mishap with this knit and I am really pleased that I got it finished. It definitely isn't as soft as #1 but I love the colours and will take extra special care of it. Granny Magpie did suggest labelling it with my name and address, which I did give serious thought to but decided against in the end. Next on the needles is an experiment with some lovely yarn I bought from here a few weeks ago on a quick trip to Devon to see some friends. The shop was amazing and I was even made a cup of tea to enjoy whilst browsing. I will tell you some more about it at a later date. For now, I must dash as I need to make a picnic to take to the beach so that we can see some of the air show. I have got lots of half-written posts waiting in the wings for pictures and some editing; I will be back to my regular-ish blogging self as soon as I have reclaimed the house. I've got a few new makes and tutorials to show you soon. Poor you and the uniform...I celebrated in July ironing my last ever pink and whitre stripey blouse, all three girls went to the school with the pink stripy blouses that make your eyes go squiffy. End of an era but 6th form no uniform around here, and my 3rd is just about to start 6th form next week, yikes!